The EMF Balancing Technique® is an elegant and graceful form of energy work developed over a period of twenty-two years. There are a total of 13 phases of the technique. 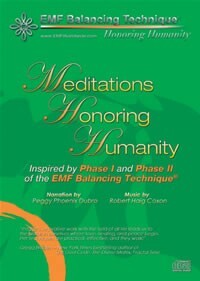 With this CD you can experience the essence of the first two phases at any place and time. Robert Haig Coxon was born in Montreal, Canada and studied composition at McGill University. Highly regarded as a multi keyboardist, Robert draws on a broad range of personal, spiritual and musical experience to create his music for meditation. He has been nominated four times for the prestigious “Felix” award (French equivalent to the Grammy), and quickly became Canada’s best-selling New Age artist. In 1995 he released The Silent Path, which almost instantly became number 1 in Canada and France.